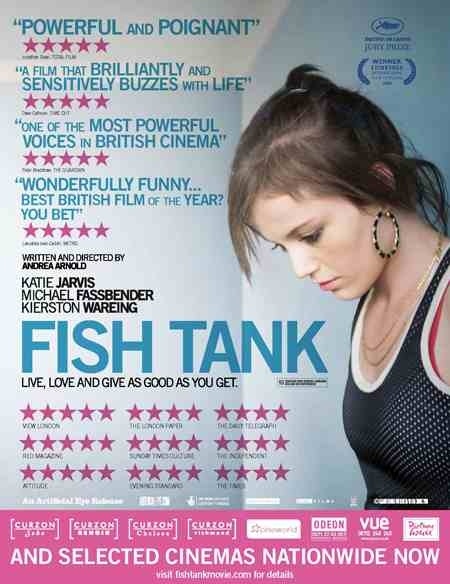 Starring: Katie Jarvis, Michael Fassbender, Kierston Wareing, Harry Treadaway, Rebecca Griffiths, Sydney Mary Nash. Director Andrea Arnold’s debut “Red Road” was a raw and vivid portrayal of a working class Glasgow area. Now she takes us to a working class Essex area with just the same impact and realism. Ostracised by her friends and excluded from school, Mia (Katie Jarvis) is a lairy teenager living in a high-rise block with her mother and younger sister. One day her mum brings home a charismatic stranger (Michael Fassbender) who shows genuine care for the girl but may also care in ways that will add to already hothouse living conditions. Directors Mike Leigh and Ken Loach are no stranger to exploring dysfunctional families in working class drama’s, but now there are several quality directors appearing with voices (and eyes) of their own. Shane Meadows, Peter Mullan and Lynne Ramsey are a few and now Andrea Arnold can count herself as one. This is a simmering drama full of anger, frustration, sexual tension and desire. Katie Jarvis (in her film debut) as the testy teenager, who can’t quite contain her emotions, is marvellous in the lead role. Aided by an enigmatic Fassbender. The chemistry between them is key to the whole film working and they both deliver excellent performances. Jarvis has yet to come into her own with further work but it’s easy to see why Fassbender is now in high demand. Full of suggestion and supression, this is an intense sexually charged film that director Arnold handles deftly. As British ‘kitchen-sink’ drama’s go, this can proudly include itself among the finest and Andrea Arnold is without doubt a director for the watching. Powerful stuff. This entry was posted on February 2, 2012 at 10:21 am and is filed under Drama with tags 2009. You can follow any responses to this entry through the RSS 2.0 feed. You can leave a response, or trackback from your own site. Thanks again Vern. This was a very strong film without a doubt but I do agree, that the characters were difficult to like or relate to. That being said, Fassbender and Jarvis played them brilliantly.